Hello and welcome to the 445th installment of the SWD. Ahrar al-Sham’s prominent commander and figure, Farouq Ahrar (Abu Bakr) resigned from his position within the group. After resigning from Ahrar al-Sham, Farouq Ahrar reportedly joined the Free Syrian Army’s Liwa al-Mutasim. Syrian Democratic Forces released a video statement announcing the start of military operations, aimed at capturing Al-Dashisha and surrounding areas from the Islamic State. The military operations will be backed by the CJTF-OIR and coordinated with the Iraqi Security Forces. Faylaq al-Sham released a statement announcing that Liwa Shuhada al-Islam Darayya officially joined the faction. Islamic State launched an another attack against the Syrian Arab Army and its allies near Al-Bukamal (Albu Kamal) and Hasrat in eastern Deir al-Zour. 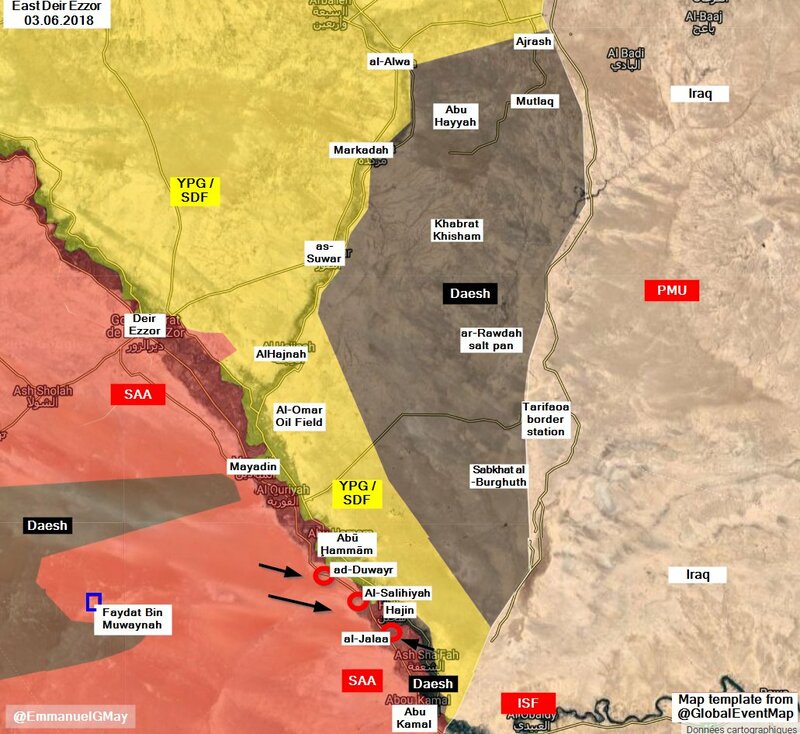 However, this time several reports claim that the Islamic State managed to capture Hamar oil field and large parts of Hasrat village, as clashes between the two sides reportedly continue around Al-Jalaa and Al-Ramadi. According to the pro-government sources, the Syrian Arab Army and allies continue to repel Islamic State’s attacks in the region. Free Syrian Army’s Liwa Shuhada Nawa and Liwa al-Shahid Ahmad al-Suqr arrested four civilians and a fighter of the Free Syrian Army, as they were on their way towards Izra in order to conduct reconciliation with the Syrian government. Free Syrian Army’s Jaysh al-Thawra coalition released a statement separating itself from Liwa Burkan Houran, due to latter’s alleged condoning of reconciliations with the Syrian government in Kafr Shams. Liwa Burkan Houran’s commander, Wassim al-Zarqan denied having any knowledge about reconciliations in Kafr Shams and also stated that Jaysh al-Thawra dismissed his group based on orders from abroad. Afghan National Security Forces conducted cleaning operations against the Islamic Emirate of Afghanistan (Taliban) in Jat Sheikhi and Ghulam Sakhi Arbab villages of Khaja Sahib Posh district, killing 29 elements of the group, including commander Qari Zubair, as well as wounding seven and arresting one element, according to the Afghan Ministry of Defense. Afghan National Security Forces also reportedly destroyed two vehicles, three motorcycles, and several ammunition caches in the operations. Islamic Emirate of Afghanistan ambushed and killed an element of the Afghan Local Police in Kala Tordi area of Gurziwan district. Afghan National Security Forces killed four and wounded three elements of the Islamic Emirate of Afghanistan in the province. Islamic Emirate of Afghanistan repelled and counterattack an Afghan National Security Forces’ offensive in Kohistan district. Nine elements of the Afghan National Security Forces were killed and over a dozen wounded in the encounter. Yesterday, the Afghan Ministry of Defense stated that the Afghan National Security Forces killed 12 and wounded 14 elements of the Islamic Emirate of Afghanistan in Kohistan district. Islamic Emirate of Afghanistan’s Al-Emarah News stated that the group captured six villages and a large area from the Afghan National Security Forces in Nari district. Islamic State conducted a suicide attack in the city of Kabul, according to the group’s Amaq Agency. The agency also stated that around 40 individuals were killed and wounded in the explosion. Afghan Ministry of Interior Affairs stated that seven civilians were killed and nine wounded in the incident. Several Islamic Emirate of Afghanistan’s improvised explosive devices targeted an armored vehicle carrying British Army’s officers and Afghan National Security Forces to a military unit in Deh Sabz district. Islamic Emirate of Afghanistan’s Al-Emarah News claimed that the improvised explosive devices killed two British officers and two elements of the Afghan National Army. Afghan National Security Forces killed 19 elements of the Islamic State in Deh Bala (Haska Meyna) district, according to the Afghan Ministry of Defense. Islamic Emirate of Afghanistan ambushed and killed two elements of the Afghan National Police in the city of Jalalabad, capital of Nangarhar Province. Separately, an Islamic Emirate of Afghanistan’s improvised explosive device destroyed an Afghan National Police’s vehicle, killing one and wounding two policemen in the city of Jalalabad. Afghan National Security Forces killed five and wounded three elements of the Islamic Emirate of Afghanistan in Pashtun Zarghun district. Islamic Emirate of Afghanistan’s sniper killed an element of the Afghan National Army in Tarha Baghal area of Rabat-e-Sangi district. Afghan National Security Forces killed six and wounded five elements of the Islamic Emirate of Afghanistan in Andar and Ab Band districts. Islamic Emirate of Afghanistan reportedly killed seven elements of the Afghan National Army in Andar district. Islamic Emirate of Afghanistan ambushed an Afghan Local Police’s convoy in Kalata Sheirdal area of Pusht Koh district. One element of the Afghan Local Police was killed and four wounded in the ambush. Two Islamic Emirate of Afghanistan’s improvised explosive devices killed four elements of the Afghan National Army in Bakwa district. Afghan National Security Forces killed 19, wounded two, and arrested two elements of the Islamic Emirate of Afghanistan, as well as destroyed two camps, a fighting position, and several weapons depots and ammunition caches in Deh Rawud and Tarinkot districts, according to the Afghan Ministry of Defense. Afghan National Security Forces killed five and wounded three elements of the Islamic Emirate of Afghanistan in Daychopan district. Islamic Emirate of Afghanistan launched several attacks against the Afghan National Security Forces in Daychopan district, killing seven and wounding eight elements. Islamic Emirate of Afghanistan attacked an Afghan National Police’s checkpoint in Kopratif area of Nawa-I-Barakzayi district, also engaging the latter’s reinforcements arriving at the checkpoint. Reports suggest that ten elements of the Afghan National Police were killed in the encounter, while the remaining elements withdrew from the area. Islamic Emirate of Afghanistan attacked an Afghan Local Police’s checkpoint in Sar Khadoz area of Nawa-I-Barakzayi district, killing three elements of the police in the process. Similarly, the Islamic Emirate of Afghanistan attacked an Afghan National Army’s checkpoint and killed three soldiers in Naqel Abad area of Nad Ali district. Islamic Emirate of Afghanistan’s improvised explosive device destroyed an Afghan National Army’s armored personnel carrier in Naish district. Separately, three elements of the Afghan National Army were killed by an Islamic Emirate of Afghanistan’s sniper in Tanwchi area of Shah Wali Kot district.